Mrs Dufus and I were watching our daily post-dinner fare on the big screen last night when after being bombarded by ads for Robillard Hearing Aids (Hi Julia! - it's a local thing), Chip Reverse Mortgages and Acorn Stair Lifts I turned and remarked "you know, I think only old people watch TV these days". It seems all the ads are aimed at people of my advanced age, and older. Well, except for the local radio ads that pump out formats of millennium musical miss-mash. God I'm old. And then I reflect on just where I'm at. Let's see, chemo, renal diet, daily weight and blood pressure readings, taking my blood sugar three time a day for my diabetes. hearing aids, endless pills in the morning and at night, etc., etc, etc. So maybe those ads are targeted at me. Not Mrs D 'cause she's not as old as I am - she keeps reminding me. 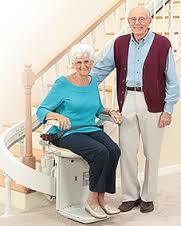 It's gotten to the point I've seen those Stair Lift ads so often I can almost recite them from memory. In fact I like to talk along with the narrative. Like with that guy of a certain age who likes to say "And I'm the king of my castle again" and then later in the ad he and I say to each other "And I was surprised at just how little it cost." I think this is a good thing. That and my daily crossword puzzle exercise my brain. Like when I shout at the television ay 7:30 "THIS IS JEOPARDY" and "AND NOW HERE IS THE HOST OF JEOPARDY ALEX TREEEEE-BECK". I know. I need a life. But the most inane thing about that ad - remember I've fallen and I can't get up? - well this is almost as stupid. It's when the announcer intones at the outset of the ad "Just don't fall". Makes complete sense to me. Oh, wait, you're selling a product? Oh, okay. I'm waiting for the day when they make that chair lift a commode chair. You know, for even older folks who can't make it all the way up the stairs to the bathroom in time. The announcer will intone "just don't poop" at the outset of the ad for a product they'll likely name the Apoop Stair Lift. I wonder where they'll put the toilet paper.